The Unitarian Universalist Association’s Presidential Search Committee begins accepting applications for the next UUA president tomorrow, November 1, 2014. Social media has been littered with posts from ministers and others asking, in effect, “Who do you want to be the next president of the UUA?” Well, I’ll tell you. Here’s what I am looking for in the next UUA president: 1. A person under the age of 50 2. A person with a deep sense of spirituality 3. A person who has a deep sense of mission and who will help Unitarian Universalists articulate our mission is in a way that speaks to our culture. I know, I know, I know. It’s time for a woman to be president of the UUA. I agree. I also think it would be great if the next president is a woman. However, I hope we avoid having candidates who are women, but who fall short of these three important characteristics. In fact, I remember gathering with a largely Gen-X group of colleagues shortly after Peter Morales’ election at the Salt Lake City UUA General Assembly in 2009. The general consensus was that Peter will be fine and Laurel Hallman also would have been fine, but what about who’s next? Back in 2009 we were talking about the need for a new generation of leadership. Our developing cultural context has only increased our need for that new generation since then. Here’s some more thoughts behind why each of these criteria are important to me. 1. GENERATION NEXT – The Unitarian Universalist Association will not be capable of reshaping Unitarian Universalism in a way that connects deeply with our culture until Gen X and millennial leaders are more widespread at the highest levels of our movement from the national staff to congregations and “beyond.” The habits and patterns that hamper us are deeply embedded in a Baby Boomer UU culture that viewed Unitarian Universalism as religion for the non religious where political liberals could hide away from the scary conservative America in which they found themselves, surrounded and embattled. I know I am over-generalizing, but I’m still on target. Too many congregations (although by no means all) have no other discernable reason for existence than to be a gathering place for like minded liberals and progressive thinkers. Many of our congregations are still more like social clubs than religious organizations. Gen Xers and Millennials are less institutionally oriented but well networked with friends. This makes them more likely to be involved with non-traditional religious communities and non-congregational or extra-congregational ways of living out their values. A Gen X or Millennial UUA president will not see these way of being UU as “beyond congregations” as in “congregations and beyond” but rather as an authentic, vibrant, and “normal” way of being UU. A Gen X or Millennial president will have a more intuitive understanding that it’s more important to network those who share our religious views. 2. SPIRITUAL – Many of our congregations have no intentional way to help people develop deep spirituality rooted in Unitarian Universalism. We lack the spiritual and reflective component of the action/reflection praxis. We are better at action such as Standing on the Side of Love, but less good at reflecting on WHY we Stand on the Side of Love. Spiritual does NOT necessarily mean theistic. In fact, to Gen X and millennial Unitarian Universalists, especially to religious professionals and lay leaders, the old theist-atheist divide holds little if any interest. Getting hung up on theism vs atheism is largely a battle no one is fighting except older entrenched folks on both sides. Unitarian Universalism offers a spirituality of its own, grounded in our humanistic approach to religion. Meditation, journaling, yoga, painting, gardening, walking – these are all examples of spiritual practices that require no specific theistic or atheistic approach. Gen X and millennial Unitarian Universalists do not argue over religious language the way older generations did and do. Arguing over language such as whether or not UU’s use the word “god” or “spiritual” or “prayer” misses the entire point of being Unitarian Universalist where each person is responsible for doing their own religious translating. I want a president who puts reflection and spiritual practice up front and calls all of us to a deep spirituality out of which we serve the world. 3. The Missional WHY – Since I am one of the early adopting cohort of missional Unitarian Universalists I am excited that “missional” has become a prominent topic of conversation in our UU universe. I am concerned, however, that not everyone in the conversation knows what that term really signifies. Missional does not equal social justice or outreach. Yes, a missional approach lends itself to much more energetic and upfront social justice work and outreach, but that is a byproduct of being missional. Being missional means to value people and their spiritual development over programming. Religious communities only really need one program – a spiritual development program for people of all ages. Being missional means being outward focussed, not inward focussed. Missional means making decisions based on relationships and others’ needs as well as your own. Missional means being concerned with the world and people outside the church walls as much as the people inside them. Missional means equipping people to serve the world around them, not just the congregation. Missional means having a reason, a “Why?”, behind what you do. This “why?” steers your course and helps your discernment. Why am I a Unitarian Universalist? Because I believe it is my task, my goal, and my calling to love the hell out of the world. I love the hell out of the world by offering an alternative to theologies of hell, separation, and punishment. 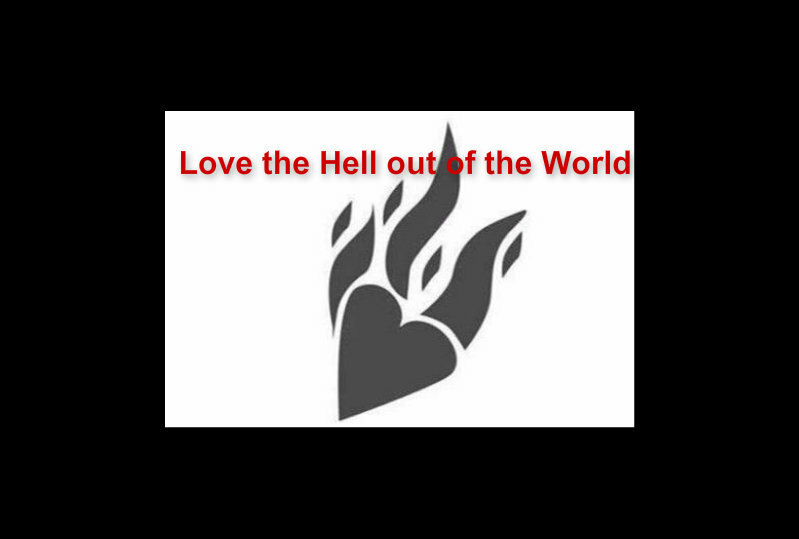 I love the hell out of the world by working to end oppression, provide comfort and healing, and combat injustice. I want a missional president who boldly articulates WHY Unitarian Universalists believe and act the way we do. I want a president who doesn’t just Stand on the Side of Love, but who Loves the Hell Out of the World. Mission first, second, and third. Speaking as someone who AARP-qualified myself, fifty is probably too old for the next president.